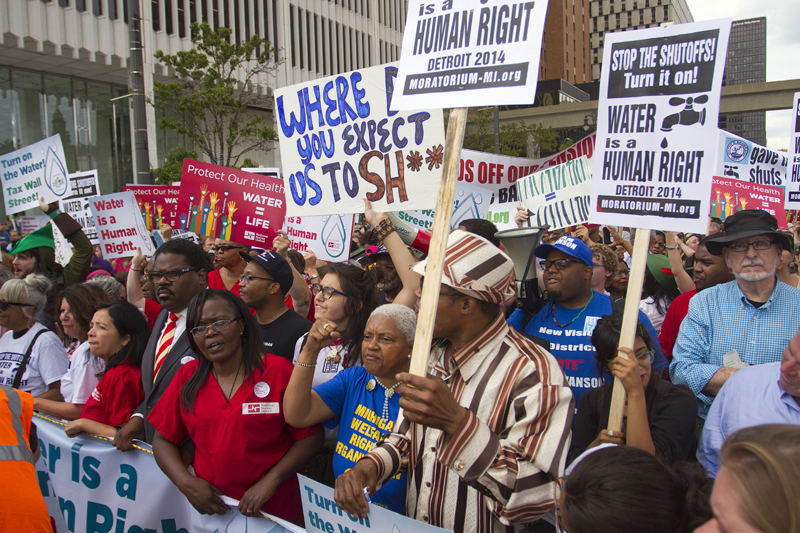 Can’t afford your Detroit water bill? People for the Ethical Treatment of Animals, PETA, will pay the delinquent bills of 10 Detroiters who face the prospect of water shutoffs if they pledge to stop eating meat for a month. The offer comes after the city has shut off 17,000 households for overdue water bills since March. Nearly 90,000 customers owe roughly $91 million. The massive shutoffs have led to protests, arrests, admonishment from Mayor Mike Duggan and an appeal to the United Nations, prompting Emergency Manager Kevyn Orr to call for a 15-day suspension of shutoffs. A donor site, DetroitWaterProject.org, also sprang up so donors can help pay delinquent bills of customers facing shutoffs. Interested in the PETA plan? Send a copy of your delinquent bill and a pledge to go vegan for a month to PETA Attn: Detroit Water, 501 Front St., Norfolk, Va. 23510. Seriously glad the word is getting out. Hope PETA’s plan to help is better publicized than the water dept’s. yea all those people and all those millions of donations… all those hollywood folks and liberals and all you can do is pay the water bill for 10 people. That is not a solution. One many of these people cannot afford the food long term if they cannot afford water bills. Vegan food is not near by, and is can be costly and hard to come by. Then there is the matter of lets say this is the solution? You honestly think PETA has 100 million bucks per year to blow on detroit people water bills ? Holy hell, how do people fall for publicity stunts like this and think this is a real solution. This is as about as real as a couple years back when that online casino would buy crazy things on ebay to get their name in the news, and pay boxers to put their name on their backs when they fought. Its just PR people being friends and liking the message. 90, 000 customers owe $91 million? thats 1,000 per customer, that sounds about right. 70-150 per month for a year or two, then they would cut you off.